BANGALORE, India--(BUSINESS WIRE)--Aug. 5, 2015-- Visa Inc. (NYSE:V) today announced the opening of a new technology development center in Bangalore, India, that will play a central role in the company’s efforts to accelerate digital commerce globally. As part of the opening ceremonies, Visa announced mVisa, a new mobile payment service that will be tested this summer with merchants across the Bangalore region and with customers of Axis Bank, HDFC Bank, ICICI Bank, and SBI (State Bank of India). Visa’s new 100,000 square feet technology center is part of the Bagamne World Technology Center, a 70-acre campus in the heart of India’s IT corridor. The center is a combination of office and collaboration spaces that will be the home for 1,000 Visa developers. This team is tasked with making it easy for application developers to access Visa’s 400 payment products and services in order to build their own payment experiences that can work across a broad range of connected devices. 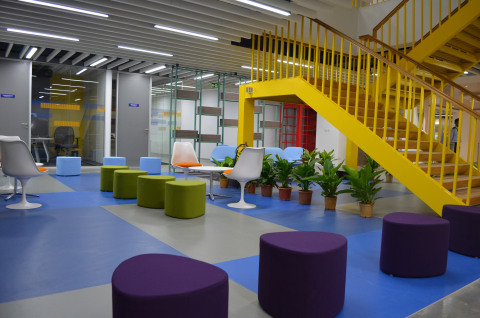 This center is one of several facilities planned by Visa in the U.S. and Asia, and is part of a global strategy to transform Visa’s global processing network into an open commerce platform. Visa developers have created a new payment service, mVisa, which brings the benefits of secure digital commerce to financial institutions, merchants and consumers in emerging markets. The new service will be tested in India later this year with select customers of Axis Bank, HDFC Bank, ICICI Bank, and SBI, and with merchants across the greater Bangalore region. With mVisa, consumers can make cardless purchases, pay bills and send money to friends and family members. Consumers will be able to download the mVisa application to their smart or feature phone and securely link their Visa debit, credit or prepaid account to the mVisa application. Once activated, mVisa enables consumers to pay for purchases in stores and online by simply initiating a transfer of funds from their account to the merchant’s account. Additionally, mVisa users will be able to pay bills and send funds to other Visa account holders. mVisa transactions are processed via Visa’s global network, VisaNet, applying the scale, security and reliability of Visa to mobile payments in emerging markets. The service is designed to enable consumers to engage in secure, digital commerce, and more easily access funds in their existing bank accounts to make everyday purchases and pay utility bills. Merchants and billers benefit by offering consumers a more convenient and secure way to pay, and are instantly notified via SMS text message when a payment has been received. Starting in September, mVisa will be available to 20,000 merchants in the greater Bangalore region. mVisa is one of several initiatives that Visa has undertaken to accelerate the global migration from cash to digital commerce. The company is increasing its recruitment efforts, adding 2,000 full time employees to an already accomplished team of technologists who will work in development centers in India, Singapore and the U.S.
1 Juniper Research: “Mobile & Online Purchases; Cards, Carrier Billing & Third Party Payment Platforms 2015-2020,” July 15, 2015.